(Updated 14.09.2015) Greetings everyone! Welcome to My Macro Rig (Part 2)! The previous version My Macro Setup turned to be one of the most popular articles in this entire website, therefore I have decided to continue writing about my recent upgrades on my Macro System here since the previous article proved to be exceedingly long as it is. I thank those who wrote in personally to ask about ways to improve their Macro Rigs, and I am very grateful to be able to guide some of you in person, I hope that we can keep the momentum going! Here, I would like to continue with my work on my Macro Rig Mark VIII. This setup provides great overall performance- You never have to worry about bringing extra batteries for the SB-700 (or equivalent) flashgun, and the flash produced is simply so powerful that you can afford to add in a few more layers of PE foams for even extreme light diffusion! Learn more about light diffusion in: 6 Things about Flash Diffusion that You Should Know. However, I wouldn’t even consider describing the Mark VIII as portable or light, which is why I set off to shred off some of the accessories of this system, so as to reduce the overall size and weight of the rig. Here I would like to introduce my Macro Rig Mark IX. Macro Rig Mark IX- A prototype. Fragile at this stage, but very functional and the results are good. This system is very much like the previous version, but I have decided to not use extension tubes any more as they are not very reliable (Read more about my story HERE). I am now using Raynox-150 and Raynox-250 Macro Conversion Lenses now as they are lighter, easier to use, render no loss of light, and most importantly, are more reliable. If you are not sure to go for Raynox-150 or Raynox-250? Please kindly read HERE. At the same time, I have designed a different, smaller light diffuser with minimal waste of your flash light. Please see the image below for the concept of the design. Flash diffusion of Macro Rig Mark IX. A flash stofen is used this time to spread the light in all directions. 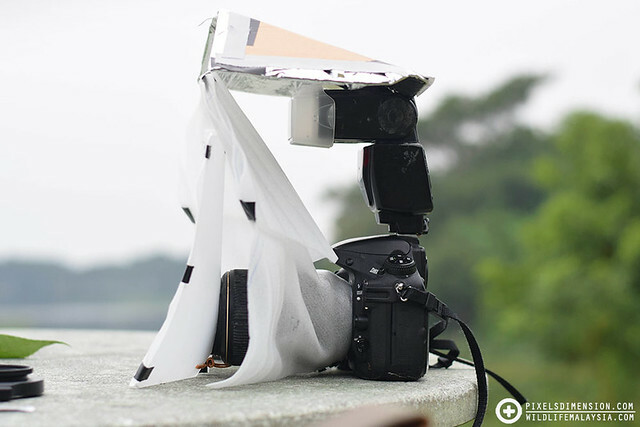 The top reflector has an aluminum foil lining to help bounce the light coming from the flashgun back onto the diffusers, this ensures light spread. The toughest part of a single flash system is that, unlike dual flash systems, it is difficult to channel your light evenly from the sides. With dual flash systems, you can easily position your light to come from the left and the right, which, with proper diffusion will result in little to no shadows at all. That said, good diffusion can still be achieved with a single flashgun like the SB-700 (or equivalent), which offers more battery power as well as flash power. The light can be purposely “channelled” from your flashgun as much as possible to the left and right sides of your system. The Mark VIII was capable of this, and so is the Mark IX, albeit the simpler design. The Mark IX makes use of a flash stofen that usually comes along with the flashgun to spread the light in all directions, which are all then reflected downwards by an aluminium “plate” at the top. This reduces loss of light, and help channels most of the light back to the subject. The system also features 2 layers of diffusion (you could stick to one layer too provided your diffuser material is good) for maximum diffusion. The overall performance is very impressive, will be shooting a lot with this system for a long term review. Please stay tune to that! ** All photos in this website are taken and owned by me. The use of any photos here is not allowed without my permission.